The Purple Princess has arrived at Hudson Coffee Traders. Straight from her home in the La Paz region of Honduras she brings with her a luscious, bright crispness and fruity notes of dried plum and pear. No, we haven’t started selling fruity smelling dolls for the Pre-K set. 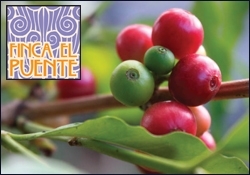 We’re talking about our new micro-lot coffee from Counter Culture, Finca El Puente. The brain child of husband and wife team of Marysabel Caballero and Moises Herrera, Finca El Puente earned the nickname Purple Princess when Peter Guiliano, co-owner of Counter Culture Coffee, first met her in the cupping room of a contest. The name stuck. This prize winning coffee has placed at the top of every coffee contest it has ever entered and enjoys an unrivaled winning streak. Revered for its silky body with well balanced notes of blackberry, blackcurrent, dried plums, white grape and pear the juicy body of this coffee will have you at Hello. The Purple Princess owes her sultry sweetness to many factors. Grown at a high elevation in a dry and dusty region amidst pine trees ( a rarity in a tropical climate) the beans are fed by pristine natural springs. The beans are then exposed to an experimental post-fermentation soak developed by Moises. They rest underwater for 24 hours following fermentation and washing in a special tank. In side by side tastings, every coffee produced in this manner had overwhelmingly better response than those that were not. The contribution of Marysabel’s warm and funny nature can’t be downplayed in the development of this wonderful coffee either. Bright, fruity and seductive, the Purple Princess just may heat your summer up a bit more. Want a chance to win a bag of HCT coffee? All you have to do is leave a comment here, retweet or re-post this blog to Facebook and your name will be entered in the monthly drawing. Winners are announced at the beginning of the month.